OK; actually, Ebola is The Strain meets the Zombie Apocalypse. 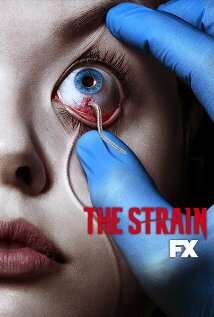 The Strain, by Guillermo del Toro and Chuck Hogan, tells the story of an employee from the Center for Disease Control, fighting against all odds to stop a plague that nobody believes can happen. One of his chief obstacles in preventing the spread of the disease is the director of the CDC—who is personally benefitting from the misery of others—and thus won’t do his job. The director’s political power is more important than doing the right thing. My nephew works in the hospital in Dallas which seems to be ground zero for this disease in the United States. I am not happy with what is going on. Yeah, nurses treated the Ebola patient with no protective gear and then treated other patients. Oh, don’t forget that the hospital discharged the guy with Ebola and he returned a few days later when he was re-admitted and later died. Memo to healthcare workings, treat this as a radiological accident (or dirty bomb attack) and your protective gear will be more in line with what you need to use. Ok so what happens when ISIS decides to purposely shoot-up some people with this disease and dispatch them to Western countries to hang-out in shopping malls? The economic panic would be about the same as the Zombie Apocalypse. Economic chaos, government collapses, and general lawlessness. It may not result in the world of Mad Max but it could get quite far in that direction. The end result is less personal freedom and more government control. Oh, we are still issuing 100 Visas a day to people in the hardest hit African countries so they can travel to the United States. On the plus side, at least Aids is not the only disease with civil rights now.